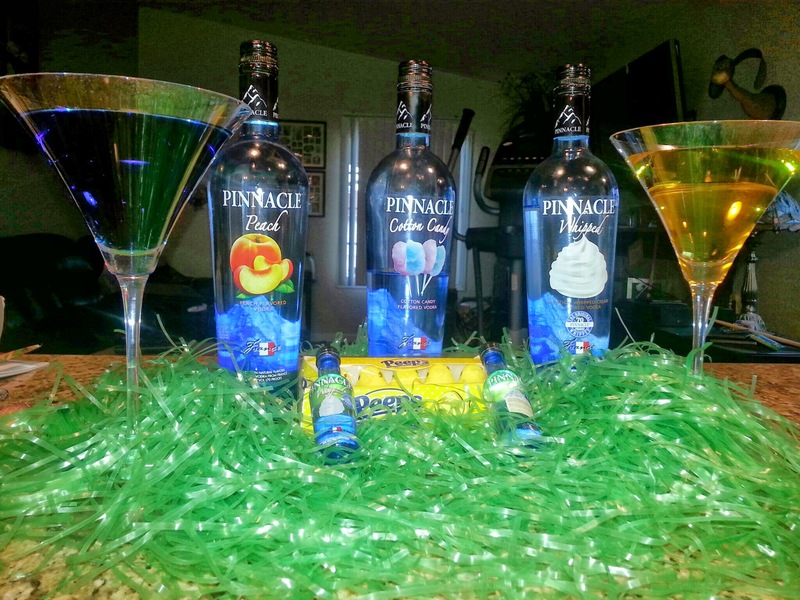 Easter is just around the corner which means there is lots of family time to come which sometimes drives me to drink, so BevMo & Pinnacle Vodka were just in time when they shared about their Spring cocktails with me! I am just kidding…I love my family time, but having a few cocktails will make me love them just a little bit more! Hahaha. The awesome cocktail recipes to put together below are just in time for the holiday, but also sound great to enjoy at any season throughout the year….sans Peeps candy of course! I am definitely not a bartender, but these recipes below seem foolproof 🙂 See the three recipes below! Directions Fill a martini shaker with ice. Add the vodka, pineapple juice, orange juice, and banana liqueur and shake until well mixed, about five seconds. 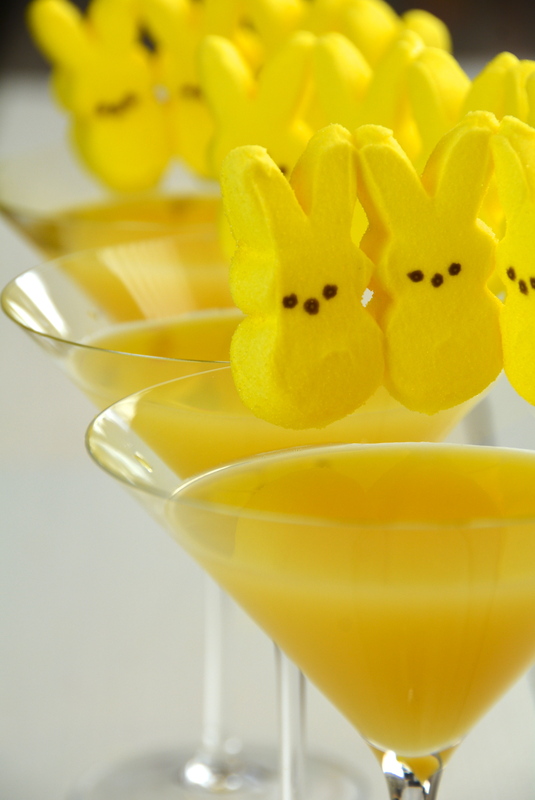 Strain into a martini glass and garnish with a yellow Peeps. Directions Fill a martini shaker with ice. Add the vodka, Margarita mix, blue curacao and mint simple syrup to the ice, then shake for several seconds to mix. 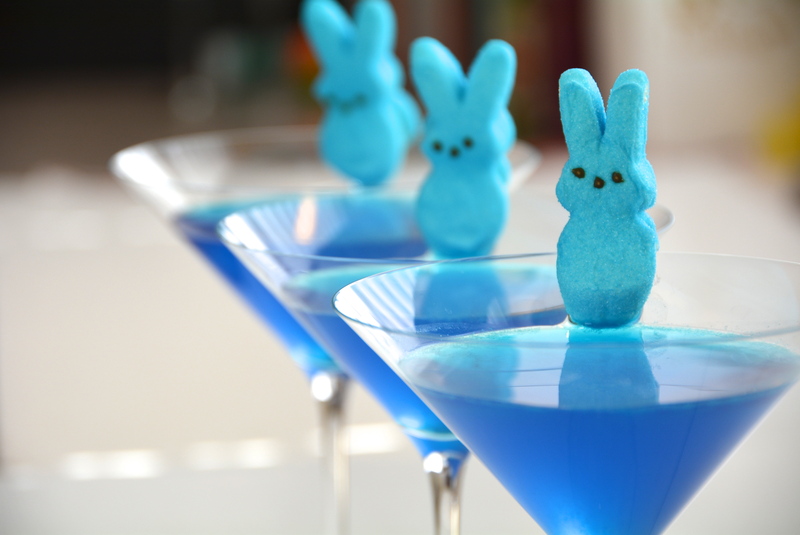 Strain into a martini glass and garnish with a blue Peeps. Directions Fill a martini shaker with ice. Add the vodka, strawberry liqueur, hazelnut liqueur, and half & half. Shake for several seconds to mix and then strain into a martini glass. 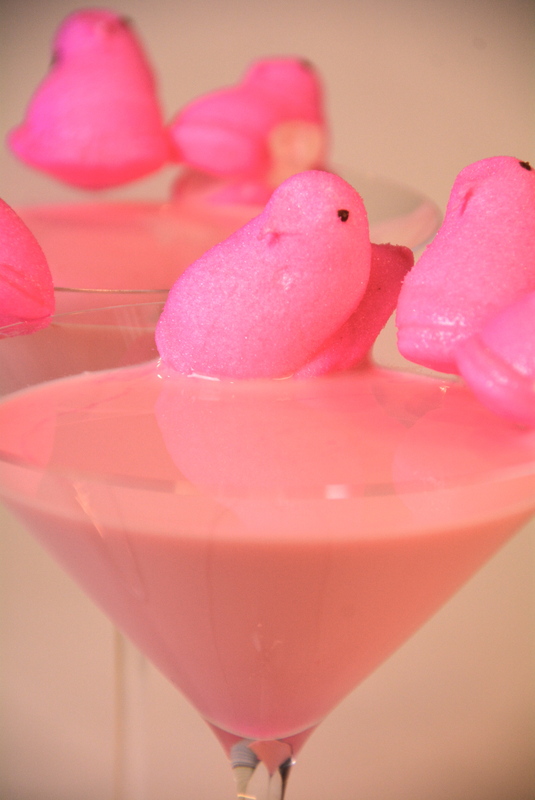 Garnish with a pink Peeps and serve. All three of these cocktails aim to please and I loved each and every one of them! 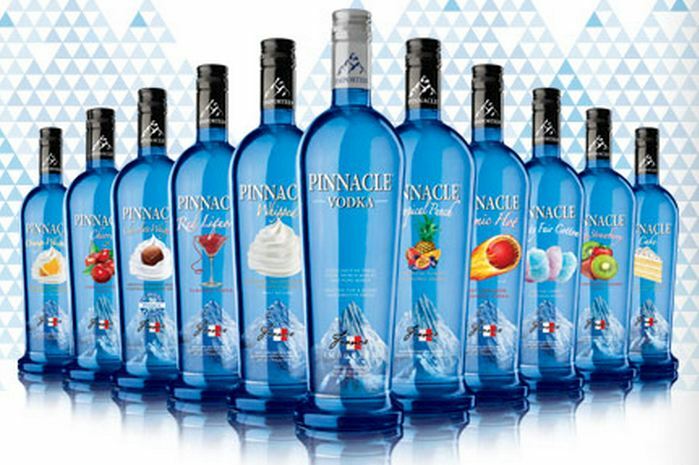 Pinnacle Vodka has a light and refreshing flavor. A lot of flavored vodkas are overdone in my opinion and I cannot stand when there is too much sickeningly sweet taste overpowering the beverage, but Pinnacle Vodka seems to hit the spot with the right blend of sweetness! Another fabulous fact about all of the cocktails above is that they are economical! The prices are very decent at BevMo and Pinnacle Vodka is quite inexpensive and costs $11.96 for a 750 ml bottle on sale, normally $12.99 & $16.99 for the 1.75 liter bottle on sale, normally priced at $19.99! 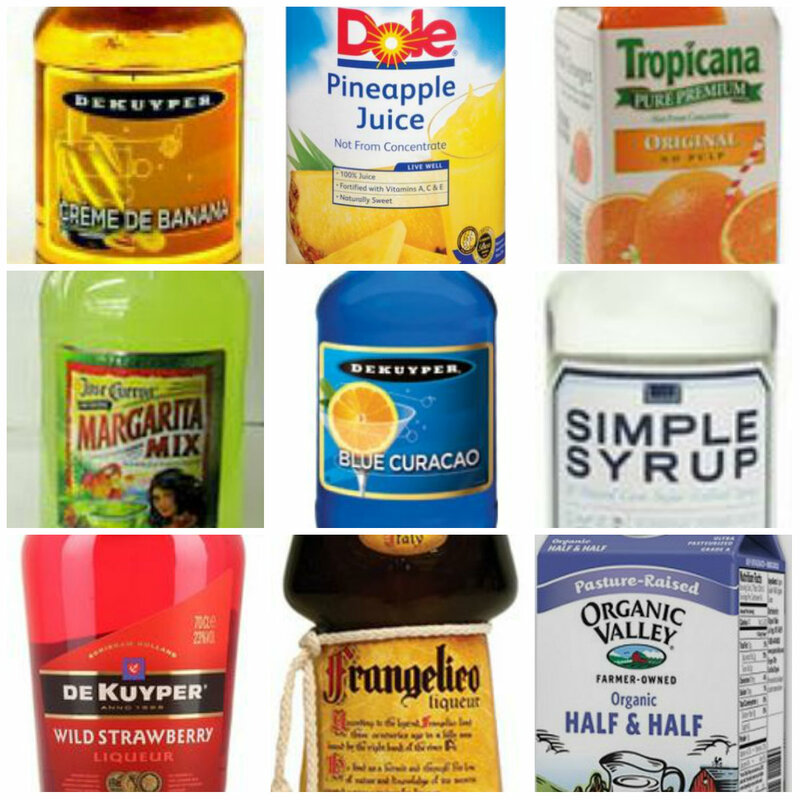 Also all of the flavored liqueurs can be found on sale for low prices at BevMo as well! Make sure to sign up with their rewards program and start accruing regular discounts and coupons! My favorite beverage out of the three was the Strawberry Peeps Cake Cocktail. Something about the blend of the rich and creamy half and half with the strawberry liqueur & cake flavored vodka got my engine running (as my mother-in-law says anytime she ingests an alcoholic beverage. :) ) Which one sounds the best to you? Please let me know if you try out these recipes. I would love to hear from you below! For some more awesome BevMo Cocktails, click here —> BevMo Cocktails for National Whipped Cream Day. Wow! These sound and look great! Will be making a few of these for Easter, Thank you! Those sound really good, now if I only drank I would be sure to try one:) may try some for my husband he may like them. thanks for the info. 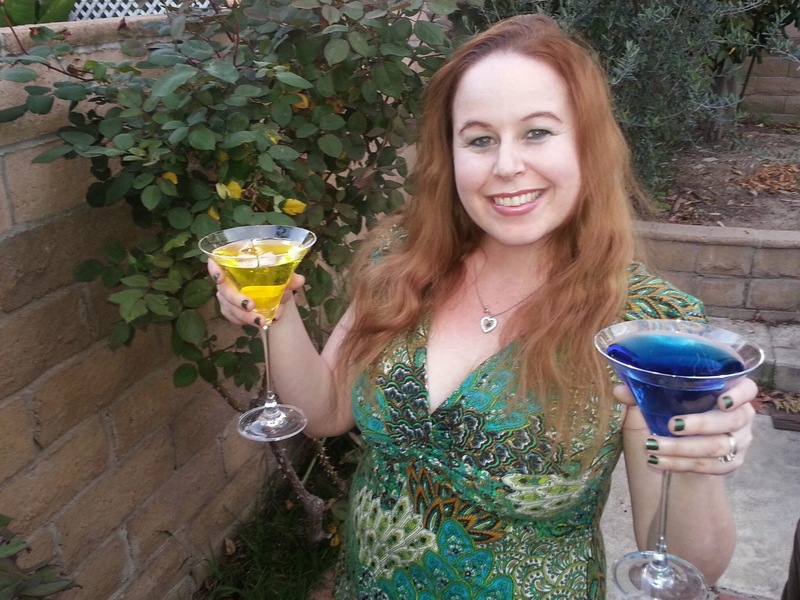 These drinks sound delicious – thanks for sharing! I will surely recommend this cocktail recipes at home! Great post! Thanks Richard:) These 3 cocktails are pretty delish! After seeing the Peeps—I think I’ve seen it all! Too cute! Those cocktails were delicious! I liked the peeps garnish the best! The peeps garnish is adorbs!! I think the pink one was super cute! Loving the peeps on the glasses..too cute! These are my kind of cocktails. Thank you for sharing. Oh yes!! So how did u like the cocktail? Yum!! Love the ideas. The very first one Peeps Paradise seems really different for me. First I thought vodka with banana liqueur? but after having it was really nice I have tried this last night with my favorite Anestasia Vodka thanks for sharing.